Job Display : This setting contains the Number of posts option. You will need to set this option to set the total number of posts that will show up on each job listings page. 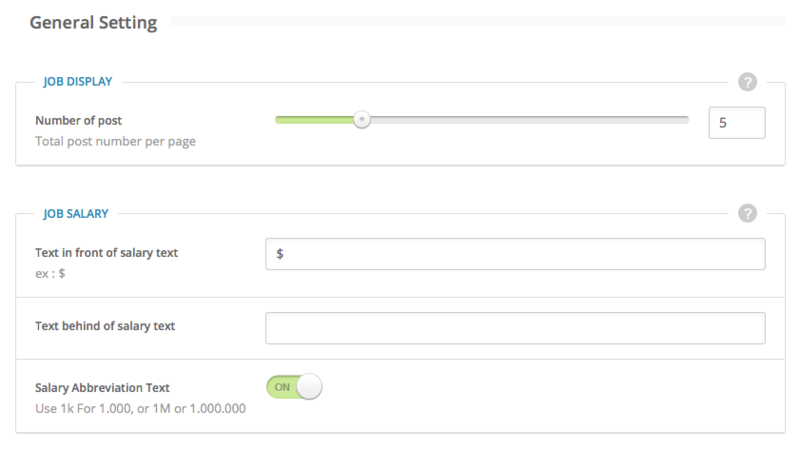 Job Salary : This setting contains several options for job salaries. Text in front of salary text : Enter text and/or a currency symbol that will show in front of the salary amounts. Text behind of salary text : Enter text that will show after the salary amount. Salary Abbreviation Text : Enable this option if you want to use the salary abbreviation feature. General Setting : This setting contains Job Vacancy Approval and Allow user to repurchase free package option. Job Vacancy Approval : Select if you want to review each new employer job submission. Allow user to repurchase free package : Enable this option to allow users to repurchase the free package once their package has expired. 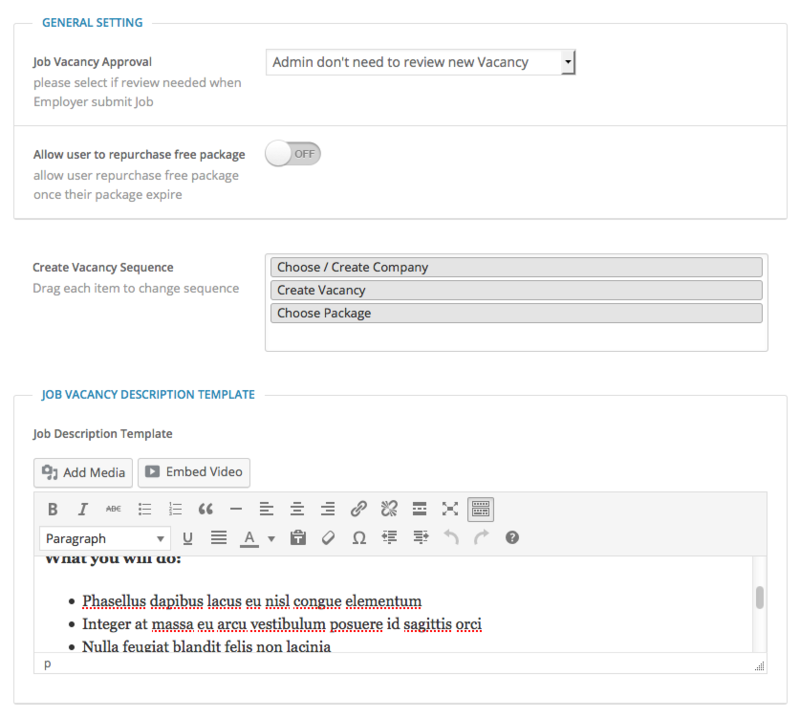 Create Vacancy Sequence : You can rearrange the sequence of Vacancies on this option. Job Vacancy Description Template : On this option you can create and edit the sample content used in the job vacancies form description. Enable captcha when user apply job : Enable this option if you want to use captcha when user are applying for jobs in order to prevent spam. 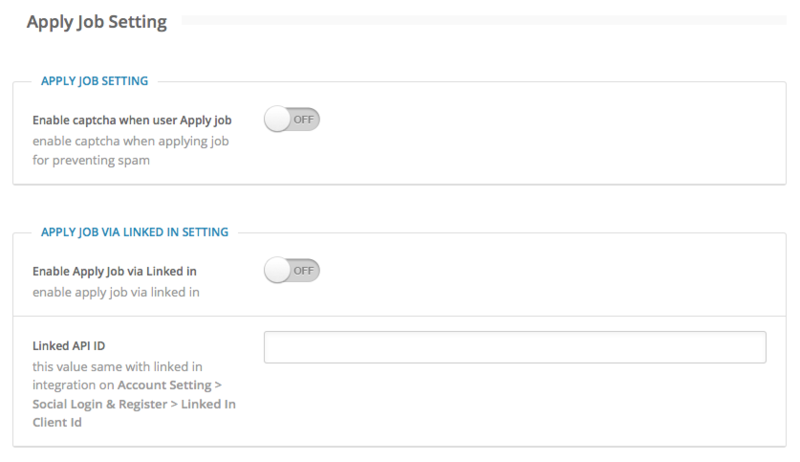 Enable apply job via Linked in : Enable this option if you want applicants to be able to apply for jobs via LinkedIn. Linked API ID : Insert your LinkedIn API ID. Resume View Restriction : You can restrict the types of roles who will be able to view the resume list. Number of resume per page : Set the number of resumes you want to show per resume page. Enable direct contact : Enable this option if you want employers to be able to contact applicants directly via email from resumes.